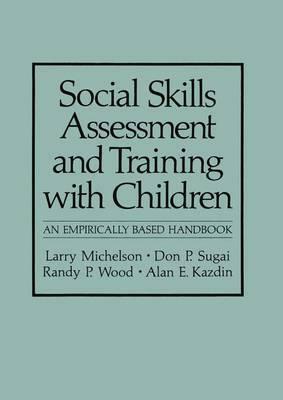 The purpose of this book is to provide readers with sufficient knowledge regard- ing social skills assessment and training with children so that they can imple- ment and evaluate social skills programs on their own. Increased interest in promoting children's social skills has stemmed in part from advances in research that have shown the importance of childhood social competency for adjustment in both childhood and adulthood. There is a growing need for assessment and training methods that can be utilized by diverse groups of professionals and paraprofessionals. This book is intended for mental health workers, teachers, educators, clinicians, and child-care personnel. The book thoroughly reviews the literature to acquaint readers with relevant findings on social skills and to pro- vide discussion regarding contemporary issues and assessment techniques. Sub- sequently, comprehensive procedures in the training of children's social skills are presented. Readers are also provided with 16 detailed training modules, each of which comprises a rationale, instructions, Scripts, and homework assign- ments. These modules are designed to permit effective implementation of social skills training programs. Moreover, they provide a structured and program- matically designed format that builds in clinical flexibility for their use with individual children or groups of children. These modules are followed by a clinical-issues section designed to address potential obstacles to effective training. Following these major sections, two appendixes have been included in the book. The first appendix is a step-by-step description of how to conduct an assessment. Illustrations note XIV, 268 p.
1 Social Skills and Child Development.- 2 Assessment of Social Skills.- 3 Social Skills Training Methods.- 4 Overview-Training Modules.- Chapters 5 Social Skills Training Modules.- 6 Clinical and Logistical Issues in Social Skills Training with Children.- Appendix A: Sample Assessment Instruments.- Appendix B: Social Skills Films for Children.- References.- Author Index.